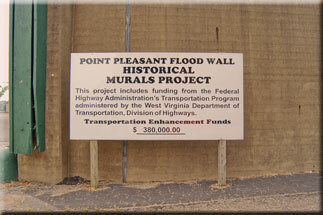 The mural, painted by world-renowned artist, Robert Dafford, is located on the south side of the floodwall at the Fourth Street entrance to the Point Pleasant Riverfront Park. 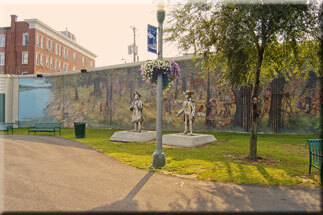 This mural depicts the Battle of Point Pleasant, fought on October 10, 1774. The Shawnee Indians, lead by Chief Cornstalk, attacked the newly arrived Virginia Militia, lead by Colonel Andrew Lewis just after daybreak. The battle lasted throughout the day. As darkness approached, the Shawnees pulled back across the Ohio River and made their way back to their village near what is now Chillicothe, OH. The Virginians pursued their attackers and negotiated a peace treaty at Camp Charlotte on October 25, 1774. The complete story can be found in “A Point in History” available at 305 Main Street and the Tourist Center. 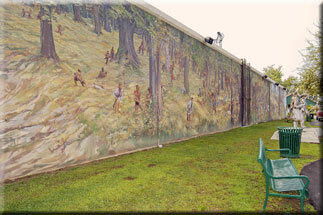 The mural is 150 feet long and from 15 to 18 ft. high. Dafford used a very special paint made by the Keim Paint Company in Germany. First the wall was water blasted. Then 1500 lbs. of a special cement and ground quartz coating was applied. The paint has permanent mineral pigments in a lime and potassium silicate base. Its life expectancy is 100 years. The paint is especially formulated to allow moisture that is wicked up through the foundation of the floodwall by the sun to evaporate through the painting without damage. The paint costs about $200.00 per gallon and it took about 70 gallons to do the battle scene.